More than 50 researchers from 30 countries are to carry out the first scientific full circumnavigation of Antarctica in an attempt to measure pollution and climate change, with the official launch held on Monday. The international team will cruise on Russian research vessel Akademik Treshnikov, leaving Cape Town on December 20 and returning on March 18 next year, braving hostile conditions in an effort to gain a deeper understanding of humankind's effect on the Southern Ocean. The Antarctic Circumpolar Expedition (ACE) will be the first scientific mission to study all the major islands in the vast ocean, as well as the Antarctic land mass. 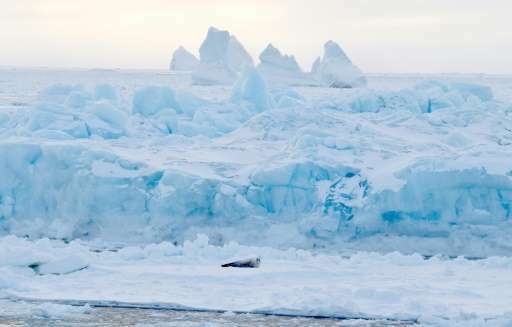 "The idea is to visit the islands around Antarctica, which is scientifically extraordinarily interesting," businessman Frederik Paulsen, a founder of the Swiss Polar Institute (SPI) and ACE instigator, told AFP at the project's official launch in London. "The changes that are going on around Antarctica are less well understood than in the Arctic and the islands... (and) are a thermometer of what's going on. "This is a project that has been waiting to happen," he said, adding that "something on this scale has never been done, and I don't think it will ever be done again." Researchers will work on a number of interrelated fields, from biology to climatology to oceanography. "Scientific progress depends more than ever on communication between diverse scientific domains," said the project's brochure. "For example, marine biology depends on complex mathematical models currently being developed by oceanographers." British Antarctic Survey professor David Walton, the expedition's science coordinator, warned scientists to prepare for a bumpy ride. "If you are seasick, you are going to be seasick," he told AFP. "There's a series of storms that sweeps around the Antarctic continually, and we will almost certainly be caught up in one of those. "The big challenge is to continue the work even when the ship is in a Storm Force Nine." The team leaders issued a call last year for research proposals, receiving over 90 ideas. A panel of experts whittled these down to 22. Adopted projects include mapping whales, penguins and albatrosses in the Southern Ocean; measuring the effect of plastic pollution on the food chain; and logging the extent of phytoplankton—the base of the food chain—and its role in regulating climate. Scientists will also take ice core samples and study biodiversity on the continent in an attempt to reveal conditions before the onset of the Industrial Revolution. "The project's ambitious because... we're trying to do the whole Southern Ocean in one season," said Walton. "It is 10 percent of the world's ocean and we want to find out if its currents are changing, if the water masses are changing and what that will mean for the future of the Southern Ocean, especially as a carbon sink. "We hope that by bringing our best ideas forward, there will be a leap in our understanding." ACE is the first project of the newly-created Swiss Polar Institute (SPI)—a joint venture comprising various Swiss research and educational institutions that aims to "enhance international relations and collaboration between countries, as well as to spark the interest of a new generation of young scientists in polar research." The journey will be divided into three legs, with Hobart in Australia and Punta Arenas in Chile serving as staging posts. Other stop-offs include the Crozet Islands, South Sandwich, South Georgia and the Mertz glacier on Antarctica itself.